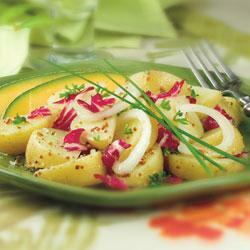 classic vinegar and mustard dressed potato salad. Simmer potatoes covered in water until tender, about 15 minutes; drain, cut in halves or quarters and place in large bowl with onion. In small bowl whisk together 1/4 cup vinegar, oil, mustard and salt and pepper to taste; pour over potatoes and toss. Fold in radicchio and remaining vinegar, to taste. Season with salt and pepper, fold in parsley. Serve immediately, or cover and chill up to 6 hours.